Naturalists carry with them into the field, binoculars and a journal. Not to make pretty pictures nor mere observations, as one teacher kept reminding us. But as tools for getting beyond the boundaries of our thoughts and into modes of seeing and inquiring that deepen our experiences and relationships with the world around us. Journaling spot on the blue, serpentine rocks of Jasper Ridge Biological Preserve. Homework from a nature photography class. The first question our photos have to answer: what is the story? Is it the first winter bud of a buckeye? Is it the colors and textures created by moss on a rock? How is it possible that in twenty years of education [my students] cannot think of any beneficial relationship between people and the environment? Perhaps the negative examples they see every day--brownfields, factory farms, suburban sprawl--truncated their ability to see some good between humans and the earth. As the land becomes impoverished, so too does the scope of their vision. When we talked about this after class, I realized that they could not even imagine what beneficial relationships between their species and others might look like. How can we begin to move toward ecological and cultural sustainability if we cannot even imagine what that path feels like? If we can’t imagine the generosity of geese? Braiding Sweetgrass is so many variations on the theme of imagining, and really remembering, beneficial relationships between people and place. How generous that they [fruiting trees] shower us with food, literally giving themselves so that we can live. But in the giving their lives are also ensured. Our taking returns benefit to them in the circle of life making life, the chain of reciprocity. Living by the precepts of the Honorable Harvest--to take only what is given, to use it well, to be grateful for the gift, and to reciprocate the gift--is easy in a pecan grove. We reciprocate the gift by taking care of the grove, protecting it from harm, planting seeds so that new groves will shade the prairie and feed the squirrels. Reciprocity is a thread woven through so many of her stories. It describes relationships that form from necessarily taking life to live, but also developing gratitude and exercising our power to care for and give back. Gifts from the earth or from each other establish a particular relationship, an obligation of sorts to give, to receive, and to reciprocate. Whatever we have been given is supposed to be given away again. When the food does not come from a flock in the sky, when you don’t feel the warm feathers cool in your hand and know that a life has been given for yours, when there is no gratitude in return--that food may not satisfy. It may leave the spirit hungry while the belly is full. Her vision is not one of relating to nature at arms length. The natural world provides so much more than opportunities for spiritual connection and moments of transcendence. Ecological systems provide the fabric and foundation for all life. We don’t step into them or visit them. They are part of who we are and re-establishing relationships of gratitude and reciprocity helps us regain that experience of belonging in a much larger web of life. 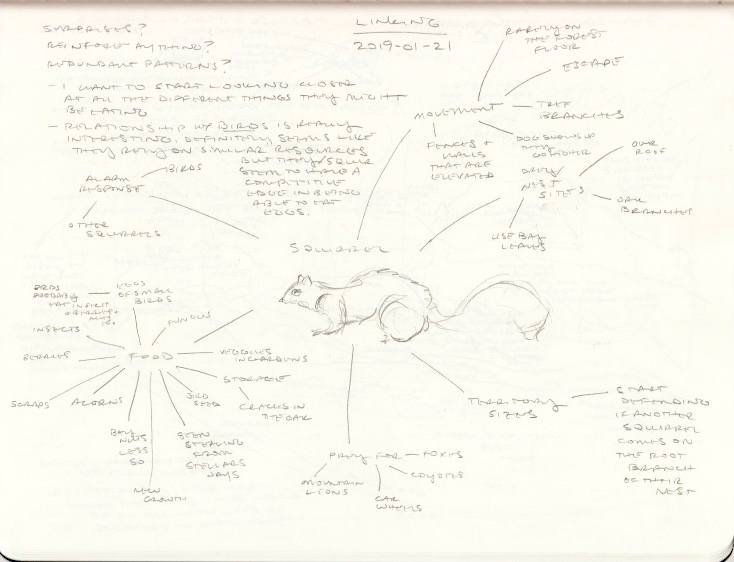 Some of the many links between a Western Grey Squirrel and their ecosystem. Do not depend on the hope of results. You may have to face the fact that your work will be apparently worthless and even achieve no result at all, if not, perhaps, results opposite to what you expect. As you get used to this idea of your work achieving nothing, you start more and more to concentrate not on the results but on the value, the rightness, the truth of the work itself. And there, too, a great deal has to be gone through, as, gradually, you struggle less and less for an idea and more and more for specific people. The range tends to narrow down, but it gets much more real. In the end, it is the reality of personal relationships that saves everything. What I find most beautiful about this lately is that if, by chance, someone’s heart is newly opened to the joy of nonviolence, stewardship, social justice, sustainability, etc. it would be their opportunity and their task to bring forward whatever creativity they had for turning that love into action—within the context of their “one wild and precious life” (to quote Mary Oliver’s The Summer Day). They may even come up with entirely new ways of living in meaningful relationship with nature and each other. How much better than giving someone a shortlist of things that "count" as contributing to climate action. This was an exercise in figuring out how I could build support for making sustainability more a part of my professional life, and really all professional lives. What can someone in any organization ask for to support sustainability and climate action? No matter their primary role. It is increasingly clear that my contribution to a more just and regenerative future will come from the joy I find in nature. Through that joy, I have the power to plant (and/or water) seeds of stewardship and sustainability in all hearts. In order to fulfill this role, I make time to connect with nature each and every day. And seek out opportunities to connect with others around creative and regenerative ways of life that further peace and love, not fear and scarcity. A team meets for retreats or trainings in a space touched by nature. We use these spaces to brainstorm what we can do as team members or cross-discipline, professional peers to reduce harm and make a positive contribution through our work, or the skills we bring, to: mitigation, resilience, adaptation, and/or regenerative ways of life. We know that we spread our message of stewardship and sustainability by living the example we wish for others to adopt. Once we have built a vision of sustainability into our team goals and support those goals with resources, we can approach other communities within our organization to replicate or ask what sustainability looks like within their own field. Team members are given the creative freedom (and time, within limits) to pursue projects that support the many faces of sustainability and sustainability actors within our organization. During extreme events, such as wildfires and poor air quality, we encourage coming together in community to support each other and connect with one other. Practically, many if not all of these things would strengthen work culture, increase retention and productivity for those motivated by a sense of purpose and desire to contribute their power and expertise towards skillful, climate action. Where I have planted or watered the seeds of sustainability and stewardship? In the hearts of which leaders, colleagues, and interdisciplinary actors? What practices or aspects of our culture have changed as a result? With whom have I shared my enthusiasm for the beauty of a season in transition? Richard Louv talks about overcoming the dystopian trance and adrienne maree brown talks about the vital importance of visionary fiction. In an effort to dust the cobwebs off my own capacity for creative thinking, I settled in one evening with the question: what kind of life would I be excited to live 5, 10, 20, 50 years from now? I had received the advice to start small. Instead of trying to imagine the whole world in vivid detail, try my life or a small corner of my life. The other reason I wanted to start small was because while I have every reason to love life fully, I so rarely do. More often than not, I experience my days and weeks as a kind of burden. Clearly, there was room for visionary fiction right here. I have long put off this kind of exercise. In my habitual way of thinking, I can’t even imagine my house still standing five years from now. And a twenty to fifty year timeline evokes nothing but fear and doubt that myself along with just about all life on Earth will still be here in any recognizable form. So I knew I’d have to listen a little deeper than all that. What might my life look like five years from now? The image of an oak-ish tree came to mind immediately. A broad, gnarled tree, growing stronger with each year it survives the dry summers and wet winters. In this image, that development translated into my relationships growing richer over the next five years, along with my joy and experiences of deep connection growing richer too. Qualities I already offer of holding peace will grow stronger. My ability to articulate appreciation will grow stronger. That seemed like a great vision for fives years out. 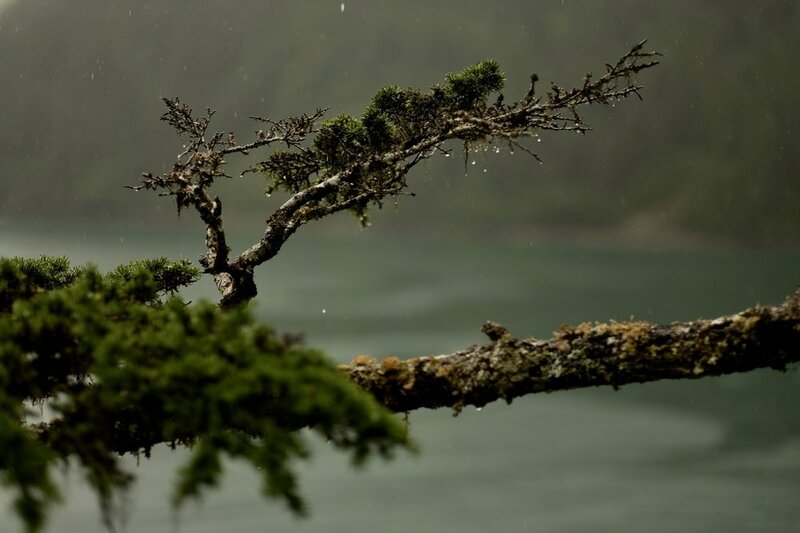 Rain on the branch of a Mountain Hemlock in Resurrection Bay, Alaska (where it’s wet in summer and somewhat snowy in winter). What about ten years from now? Again, immediately an image came to mind. This time of the tree bearing fruit. Perhaps the tree was like an olive or persimmon tree that grows for decades before fruiting. This image made me so happy. It felt so right. To be clear, the fruit and ripening was not an accomplishment reached nor significant impact finally made; a stamp on the world that I could call my contribution. It was more the result of a process that had started long ago and whose time had simply, naturally come to this. The question of twenty years brought more resistance. Twenty years is when I’ve been told life supporting systems will pass irreversible tipping points, spinning out far further than today into extremes and instability. This is the timeline I hear most often of when apocalyptic visions are supposed to take a dramatic turn for the worst. I asked my imagination if it can try a little harder. Can I see anything out beyond those fears? The image that came to mind was the branches and canopies of other trees coming into view. A microclimate starting to form from the relationship between individual trees. In my imagination, this meant really seeing the effects of other people transforming their lives too in such ways that we were all clearly coming together as one forest. I saw the installations of Living Buildings and restoration of wildlife habitats in urban spaces starting to show signs of age and maturity. 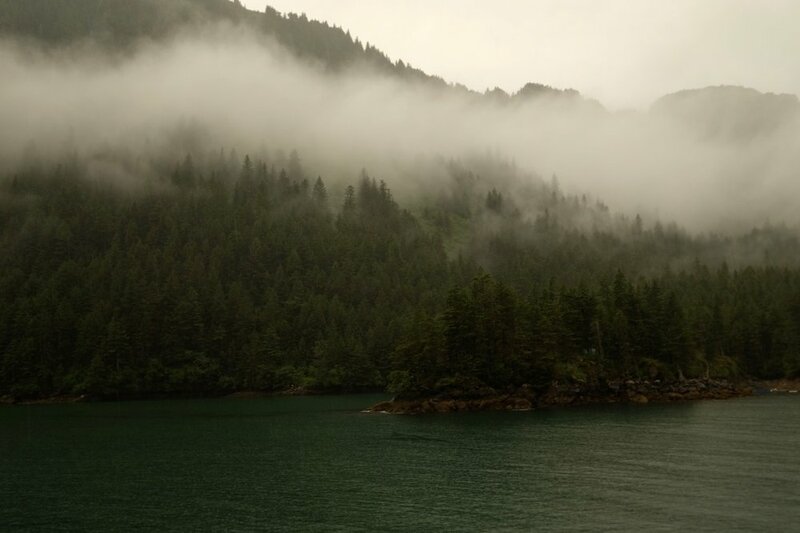 Fog on the temperate rainforest there. Can I go fifty years out? At first, I felt loss. Surely by this time in my life there will have been great loss, but I also felt repair. Next came the image of offering my strength, of having lived so long, to others younger than me. I saw wrinkles in the trunk bark of this tree; I felt wrinkles around my eyes and a soft smile. As I imagined this, my 34 year old self was smiling too. I imagined what it might feel like to be 84/85. I was sitting down and could feel a quiet joy inside that didn’t fade but was always with me. When I let these images go, and reflected a bit on the exercise, I noticed several things that surprised me. First, that the narrative took the shape of an internal landscape. Of a life walked with a commitment, in this case, to be guided by a desire to love life. The lack of external details came as a bit of a relief. I still assume the future is extremely uncertain. But that it can be navigated through as a kind of trail-less hike in the fog, where we might only see clearly the landscape around which we have to choose our next step. Another surprise was how closely it mapped to three sources of inspiration for me. The model of life stages mapped to the seasons offered by 8 Shields. The observation offered to me by a mentor: it sounds like you want to become a rainforest. Clearly, she is spot on. And the practices of being guided in all things by a clearly articulated commitment, as offered by the Strozzi Institute. The dojo being cleaned by a student after our workshop ended, Strozzi Institute. Can I walk back now from the 50, 20, 10, 5 year vision to one year, one month, a week, a day, an afternoon, an hour in my everyday life? Are there any blocks or habits that keep me on a different trajectory (thinking back to that fact that I often experience life in any given moment as a burden)? The biggest blocker that came to mind was Business As Usual mind. My habit of orienting my energy and awareness around external accomplishments and overemphasis on narrowly-defined, cognitive activities: thinking, reading, reasoning. Business As Usual comes from Joanna Macy and refers to things we do that perpetuate an unsustainable status quo. I see my habits of prioritizing work over people and external goals over connection as falling into this category. When I focus on work at the exclusion of gratitude, when I fail to give a quality of timelessness to people and my time outside, I go to sleep distant and disconnected. Spending more time outdoors, working towards nature connection, has brought this way of being into sharp relief. When I stepped outside this morning into a relatively gentle storm, and my senses extended in all directions: towards the smell of Bay Laurels, the rumble and growl of thunder far away, the feeling of wet wind on my cheeks, thick drops of water falling on my head. An experience of being fully alive and so in love with life. Work is also very often a joy for me, but one that comes at a high cost, unless I find a way to integrate this expanded awareness in which gratitude flows freely and comes easily. Integrated with the practical demands of sitting inside most of the time, at my computer, or in the company of others with computers. Perhaps through prayer, a mantra, some kind of practice, strengthening what 8 Shields refers to as the Storyteller’s Mind, I might be able to bring the storm with me back to my desk. In the Storyteller’s Mind, we call up in vivid details the sensory details of what we experienced outside. The state of expanded awareness, of deeply felt aliveness, and often, love of life. That can be carried wherever I go with the powerful partnership of mind and imagination. 25 years ago, large swathes of the Midland’s landscape had been left scarred by centuries of coal mining and other heavy industry. But a passionate group of people had a vision: a forest. The first forest to be created at scale in England for over 1000 years, it transformed and literally turned the landscape from black to green. Living buildings should grow food, use rainwater, and protect habitat, for example. They need to incorporate biophilic design, satisfying humankind’s innate affinity for natural materials, sunlight, views of nature, and more. Living buildings avoid all “red-listed” materials, such as PVC and formaldehyde. They are required to intentionally educate and inspire others—building as teacher rather than container…LBC proves that, with the right investment and expertise, buildings can do more than simply be less bad. They can function like a forest, generating a net surplus of positives in function and form and exhaling value into the world. Over time, with industrialization and urban sprawl, we have driven nature out of our neighborhoods and cities. But we can invite it back by designing landscapes that look and function more like they do in the wild: robust, diverse, and visually harmonious. What’s happening here with the plants today? Trumpet lichen peeking through communities of mosses, after the first winter rain. Feel the ground, smell the Earth; get into your senses, feel your connection to the Earth, how the Earth supports you in so many ways. Low growing plants, foods and medicines. What’s happening here with the plant’s today? Appreciation for how they tie into your life. Water on the landscape or internally. Life comes from the water. Let that appreciation flow. Animals. Pets and how they support you in your connection. Tracks, other mysteries. Shrubs; what’s happening with the shrubs? Do they have fruits on them? And appreciation to the life they bring to the landscape. Birds. Are they singing? Are they alarming? Air on your skin. Where is the breeze coming from? Sky, clouds, weather. Moon. Can you point to where it is in the sky? What phase it’s in? So many cycles of life tied to the phases of the moon. Feel that inner connection of life to the moon. Sun. Bringing life to Earth. Where is the sun? Pockets of shade? Stars. Remember all the stories that are up there, painted across the sky. Where is the North Star at night. Get a sense of direction from them. We’re always at the center of the 4 directions. Where are you in relation to the 4 directions? Really nice way to center and ground yourself in your spot. Time, movement of life across time. Recognize your place in the cycle of time. Life that is coming too and we get to be in the center of that going and coming. Own body, on creativity. What is creativity bringing forward in your life today? Ecophobia: children are conditioned at an early age to associate nature with environmental doom. Our engagement with nature is being replaced by solastalgia – the pain of seeing natural areas disappear, and the disengagement that goes with that. Lack of cultural and ethnic diversity within the environmental movement and conservation agencies. It's time to create that vision. It's time to bring down the barriers. Hard? Of course. But we can do the best we can while we're here on Earth, and millions of children will surely experience the wonder of nature that past generations took for granted. No future is guaranteed to happen. One thing is for sure: A greener future will not happen unless we can see it in our mind’s eye, unless we can imagine it. Today, if you ask people to describe images of the far future, many and perhaps most people immediately describe a postapocalyptic future. What happens to a culture that can no longer see a beautiful, nature-filled future? Despair is addictive. The challenge is not only to oppose the current trajectory, but to escape the dystopian trance. I started paying attention to climate change and climate action during the last major California drought. But at the time, the Paris Agreement was just signed, the Dakota Access Pipeline was just called off. There was a euphoria among everyone I talked to about the success at Standing Rock and how all of these events were ushering in an era of global recognition that something dramatic needed to happen, accompanied by the will to do so. A month later, all that changed. The night of the 2016 election, I remember staying up until dawn looking for what I could do as an individual. What can I do to make a difference? What actually needs to happen? It was clear I could no longer leave it up to someone else. Making a few donations wasn’t going to be enough. Alongside my exploration of external actions, I committed to an investigation of an entirely new and very dark internal landscape. My inner life felt overwhelmed by fear, anger, anxiety, guilt, hatred, and most potently, despair. I feel very fortunate to have been in a position professionally and personally where I could reach out to, spend time with, and in some cases pay for professional counseling to help me navigate this space. Already finding myself in Zen communities, I also chose to deepen my relationship with the practices and rich perspectives of this spiritual tradition. I also read voraciously any book I could find on this topic of how to deal emotionally with the realities of climate change. Without this period of internal investigation, I would likely not have moved forward. The first few tentative steps my husband and I took in the way of external actions involved removing fossil fuels from our lives, as much as possible. We gained an understanding of embodied energy and how to measure the cost of replacing cars and heating systems against their lifetime expected emissions. Sri dove very deep into energy systems. And transitioned his career from computer storage to something that allowed him to participate meaningfully in discussions around how to move towards renewable energy and greater energy efficiency, generally, in the computing space. I went in a completely different direction. I headed out looking at local politics, local action, and strengthening my own nature connection. I wanted any response I took to come from a place of love and the embodied wisdom that arises for all of us from time in nature. The other thing that differed about my trajectory was I had studied nonviolence in college and reached back out for guidance from writings by Gandhi. This led me down a path of finding an organization called the Metta Center for Nonviolence, which has a very holistic vision of action in service to our time (explore their site). Many people echo this vision, in which climate change is tied to a complex web of interrelated issues; merely one part of a multi-prong transition that is happening and needs to happen. Joanna Macy refers to it as the Great Turning. I’ve also heard it called the New Story. Proponents of this larger perspective might say, the problem is not just CO2 in the atmosphere and how to get it out of there, though that needs to happen. Rather, they’d say, we’re less likely to succeed without other ill effects unless we also start replacing punitive justice with restorative justice, our growth economy with a more sustainable needs based one, and tightly controlled power with diversity among decision makers, etc. Over time, Metta and the community around their work has become an important home for me. The material they offer helped get me out from under my sense of despair and helped me begin to see untapped sources of personal power in myself and others. All of these explorations have significantly deepened my relationships, my commitments, my appreciation for life and sense of purpose. What I feel now is a strong desire to start consolidating my efforts, so that I can make space for the qualities and behaviors I want to role model. Like making room for laughter, for processing grief daily, for continuing to learn about what’s going on and how our understanding of things like nonviolence and the power of constructive program are developing. On so many levels, I see how Sri and I have transitioned our life and our focus to be ready to act as new possibilities for regenerative ways of life emerge. One area that has remained largely resistant to change is my profession. For a good year, I tried transitioning to the green building industry. I was inspired by the Living Building Challenge, which I still consider to be the most inspiring example of a transition from conventional to creative and regenerative ways of life. While the LEED generation of green building standards said, let’s do less harm, the Living Building Challenge said, we can do better than that. We want every single act of building to improve the world along a variety of different measures including justice, equity, as well as sustainability. In addition, they included requirements around beauty and biophilia. The writers of this standard argued, we care for what we love and when we have the opportunity to connect with nature, we rediscover a core joy we find in seeing life thrive. This attempt to transition my career failed. My excuse: it’s just not that simple mid-career. I’m not a student, still undecided about what I’m going to major in. And there’s not dozens of student services at my fingertips, trying to help me connect with networks and resources to succeed in any field. I have a home, I have a family, I have certain expectations to work in a mature work environment, none of which I had earlier in my career. And I have a collection of skills that I’ve gathered over the particular path my career has taken, which are largely concentrated in the area of technology. It’s still a mystery to me what might happen next professionally. But I’m more convinced now, that if I continue participating meaningfully in service and climate action, my next professional move will bring me closer to this side of my life. One thing I try to remember is that I chose technology for a reason: it allows me to interact with people working on all fronts of social change. As a web developer and now web project manager, I’ve gotten to work with human rights organizations, environmental researchers, and everything in between. That perfectly suits my spirit because what moves me is really everything. I cannot see myself having been someone only committed to open space. While I believe open spaces are essential, I also care about what’s going on in the energy space and the community choice energy space. I also really care about climate justice, how we’re designing for resilience and rebuilding communities after natural disasters. I want to return to this idea of climate action being so much bigger than one’s profession because I got stuck here for quite some time. Now, I see all of the following questions as part of my response: how am I in my neighborhood? How am I in the larger community of the Bay Area? How am I in relation to the nonprofit organizations working in these areas? Am I an active participant? Am I friends with the people who work there? What are the qualities of my relationships? How do I answer people when they say, how are you doing? How do I respond when someone complains about smoke in the air from fires? Am I furthering people’s fear or providing them in subtle ways with the tools they need to get started or continue along their own path? Am I creating a culture of love at home? Am I balancing civic participation with the richness of experience that comes from a carefully and collaboratively cooked meal? Or am I perpetuating a culture that overemphasizes work product, fast pace, and productivity? In my head, I keep replaying a story told by Jon Young of the 8 Shields Institute. He was sharing how earlier in his career, he received a bit of feedback from one of his mentors, Gilbert Walking Bull. This mentor pointed out, you’re all so unhappy. You need to realize the kids are watching you. And they’re seeing that you’re miserable thinking that you’re going to save the world and you’re going to save the children. You have to find within yourself the capacity to laugh. You have to hold onto your happiness. You have to make this work a source of joy because that’s what going to inspire them to follow your example. This story reminds me to focus on how am I living in the world and not just what am I spending my time doing. It has also helped me to be a little more patient. This is really a multi-generational project. And I feel honored at this time to participate in it with an increasing number of people. And now a list of the things we’ve tried. At first I made them because they’re quick wins. Now, I make them because they’re another way to express my relatedness with people and the planet. Along those lines, I consider any one consumer choice far less important than whether it moves me and those around me in the direction of love and a spirit of stewardship. Installed solar panels on our house. Installed heat pump heating and cooling, to get away from natural gas. Installed electric water heater, same as above. Leased electric cars, after confirming the embodied energy of a new car is less than the expected harm from emissions over a conventional car’s lifetime. Installed dual pane windows, to reduce the need for heating and cooling. Treated termite infestation with non-toxic orange concentrate instead of the more common compounds which are cancerous to workers who have to handle them every day and are a greenhouse causing gas. Began purchasing and eating only local and seasonal produce, no more tomatoes in winter. We also purchase organic and fair trade food when possible. Began purchasing energy from our Community Choice Energy provider, Peninsula Clean Energy, through their 100% renewable plans. Sri also weighed in at Silicon Valley Clean Energy board meetings, when they were figuring out their rate plans. Started investigating the supply chain of companies we purchased clothes and products from. And looking for chains of custody or certifications on materials. Relatedly, began choosing clothes that would allow me to have a smaller closet. For example, a core component of Eileen Fischer’s mission is to design clothes that allow people to purchase fewer of them. Her company is also employer owned. We’re working with an advisor to helps us divest retirement funds from fossil fuels and natural gas. Chose to significantly reduce flying for work and vacations, we’re primarily vacationing where we can drive to on electric miles. Measure water usage when showering. I removed meat and dairy from my diet and make efforts to find plant based sources of protein. Began prioritizing products that were manufactured closer to home, including a recent bed frame and mattress manufactured in LA. Estimate carbon footprint every year and purchase carbon credits to more than count for what of our lifestyle is still not carbon neutral or negative. Donate to organizations furthering research, policy and climate action. Participated in Community Advocates Leadership Academy, a 9-month program hosted by the Committee for Green Foothills and Acterra on participating in local politics. Volunteer as an EV Ambassador, a program through Acterra that encourages electric vehicle adoption. Attend our town’s Environmental and Sustainability Committee meetings. Participated in California Naturalist certification program, a 10-week program hosted by the UC system and Grassroots Ecology. Environmental Stewards Program Participant, a 10-month program hosted by the Sierra Club’s Loma Prieta Chapter. Participated in MidPen’s Sudden Oak Death collection efforts in Bear Creek, a park to be open in the next few years. Also collected samples in our town of symptomatic Bay Laurel leaves for Matteo Garbelotto’s efforts to track Sudden Oak Death along the California coast. Volunteered with Our City Forest, an urban forestry nonprofit in San Jose. Visited EcoHouse, a model home in Berkeley. Sri volunteers with SunWork to install solar on homes. Participated in Women’s Environmental Network event on forming an environmental vision for one’s work and life. Participate in local emergency preparedness efforts and training, because natural disasters are already increasing in frequency and force. Helped friends with their efforts to begin composting. Grew our own vegetables and fruits in Sunnyvale; where we live now is too shady for this, but I still grow our greens. Replaced the lawn in Sunnyvale with native vegetation also known to support pollinators. Occasionally, review the plastics in our recycle bin and see if we can eliminate any. We now bake bread and make nut butter and yogurt as part of this effort, and turns out it’s super fun. I never felt love for the consistency of yogurt until I started making it. Reuse gray water whenever possible. One Earth Sangha, an online buddhist community that offers trainings for environmental activists on how to handle the emotional side of this work. I volunteered with them for about 8 months, supporting their web related needs. 8 Shields, an online community that offers trainings in nature connection, connection modeling, mentorship, what they call culture repair, community building and facilitation. I’m in the middle of one 9-months program on community building and one 6-month program on nature connection. Metta Center for Nonviolence, a nonprofit based in Petaluma that offers training the history and practice of nonviolence. I took a 9-month course with them and now volunteer by passing along research I find on compassion, cooperation, empathy, etc. Strozzi Institute, a business that offers training in embodied leadership. Their coursework is inspired by Aikido practices and grounded in the work of a partner organization called Generative Somatics that offers training specifically for those working in social and environmental justice. I was given registration to one of these workshops as thanks for helping rebuild the website of an associated Aikido community. 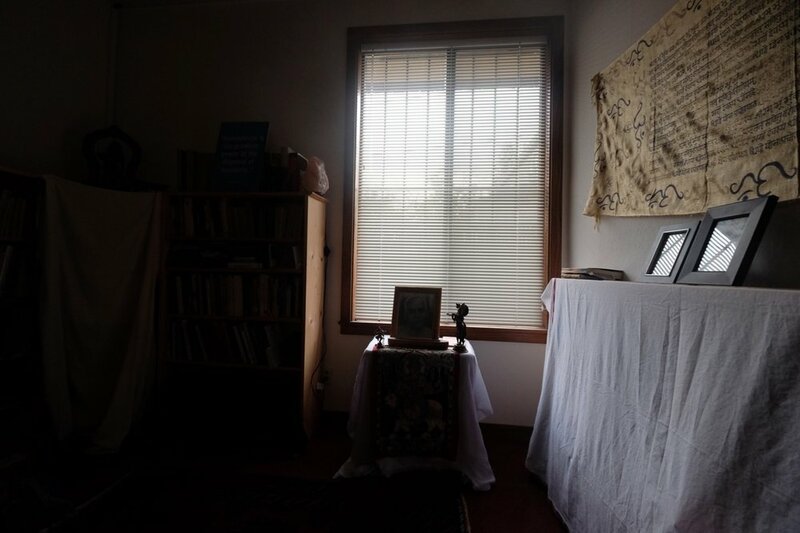 Responding to the Cries of the World, a course I took offered by the San Francisco Zen Center based on Joanna Macy’s work. Finding Ease: A Zen and Mindfulness Approach to Anxiety, another course offered by the San Francisco Zen Center based on Lee Lipp’s work. Winter Practice Period: Offered by the San Francisco Zen Center; participated as a remote and commuter student. Stanford’s Help Center, I met with therapists a number of times to better understand anxiety and worry when they became debilitating and disconnecting. Whitney Hess, a career coach I worked with to help begin peeling the onion of how to better align my career with my aspirations to be of service to causes I care about, while still meeting my needs for working in mature work cultures. I start my day sitting outside for several minutes, watching squirrels harvest acorns or the sun come up. This is what 8 Shields refers to as a core routine for developing attributes of connection and they are so right. It’s so much fun. Dokusan, the Zen practice of meeting with a teacher one-on-one. A career coach I worked with earlier in my career happens to also be a zen priest, so I reached back out to her for help understanding fear, grief, etc. Living Compassion New Years Retreat on fear, a Zen community outside Murphys. From my time working at the web consultancy, Giant Rabbit LLC. Coming Back to Life, Joanna Macy. Powerful frame, language and exercises for moving through this space with life-affirming principles as your north star. Transformational Resilience, Bob Doppelt. Best book I’ve come across for thinking about and personally preparing for a less stable future. Emergent Strategy, adrienne maree brown. An absolute gift, not only for her stories and strategies, but also just the powerful spirit of birthing new realities and futurism that she brings to change work. Pursuing Sustainability, Pamela Matson. Fantastic focus on wellbeing. I also appreciate it is so much more matter of fact than most books on climate change, rooting its research and tone in stories of similar transformations from the past. Cosmos the TV Show, Carl Sagan. Wonder boxed up in a set of DVD’s. The Courage to Be, Paul Tillich. Really helpful exploration of what it means and what one experiences after affirming life in the face of death. Man’s Search for Meaning, Viktor Frankl. Powerful exploration of what it means to carry a desire to work with purpose in life. Walk Out Walk On, Margaret Wheatley. Stories of communities re-inventing themselves along Living Building lines. The most powerful pages for me were on the transition from hero activist to host. Mindfully Green, Stephanie Kaza. Sri bought this book for me. It was the very first book I ever picked up on environmentalism. Blessed Unrest, Paul Hawken. It’s been a while since I read this, but Paul Hawken is a very often referenced writer and this is a very often referenced work. Drawdown, Paul Hawken. I first learned about Living Buildings in this book. What I love about it is the team who compiled this thought really big and included many things generally considered outside the field of environmentalism. Ever the Land, about a tribe’s reconciliation with the New Zealand government and efforts to build a Living Building as a community center to support educational and economic upward movement for their people. There’s a lot of good language in here about resilience and relationships to place. The Consumer's Guide to Effective Environmental Choices, Union of Concerned Scientists. I believe this was the second book I read on environmentalism. What I still love about it is that a lot of consumer choices don’t matter. And they do a good job of explaining the importance of focusing on what does. If nothing else, perhaps my participation in these things has simply supported the work of others. And with that alone I would be so happy. I’m perhaps most grateful for the relationships with old and new friends that have deepened or started as a result of these explorations. The creativity and determination they bring to their work supports and inspires my own. And the joy that comes from their company suggests I’m on the right path for me. Because at the lower levels of felt sense, I can say without a doubt I feel more alive and more in love with life than before I started asking myself and others: what to do about climate change. You have to laugh much harder. I hear you guys talking about how you’re helping young people; how you’re going to save Mother Earth and do all these great things. But those children are looking at you. You guys are always in a bad mood, you’re always working so hard, you’re always tired. You’ve always got a bad taste in your mouth about what’s happening to Mother Earth. And you’re angry at the people. Those children are looking at you and saying I’m not following that person because they’re miserable. My people know this. You guys have to understand no matter what you think you’re doing, you’re turning them off. You have to play more music. You have to dance more. You have to laugh much harder. Your not laughing half the time, you’re so serious about everything, like end of the world is coming. Those kids are watching. You’re worried about them, but they’re worried about you. You guys need to learn to get over yourselves, overcome that feeling inside you that your heart is so heavy with grief about the future, about the land, about the people, about work. But think about my people. What we had to overcome. We were hunted by your ancestors; we were killed in cold blood. Our own ancestral land taken from us; we were put in reservations like prisons. You know, my people suffered under this. But we maintained a happiness inside ourselves because our children have to see that in us. It’s the only hope they have. So you have to learn this, this is role modeling. This is how culture comes alive. Without it, this doesn’t work. It’s a hard life, but we’re going to laugh anyway. If you’re going to tell a story, tell it with everything you have. If you’re going to sing a song, sing it with everything you’ve got. And if you’re going to dance, you dance. If you’re going to laugh, laugh hard. Create Islands of Sanity wherever possible. - Through our presence, we serve as reminders and role models of who every human being is capable of being. - With our leadership, we bravely stand in stark contrast to the current practices and dynamics of this age. We know what must be remembered and preserved to create good human lives and societies, and we embody this wisdom in our work. In this spirit: I choose not to perpetuate fear based attempts to manipulate and move people to action. These are often pandered by well meaning nonprofits trying to convince a largely apathetic public that something matters. It does matter and we do need to act, but we already lost 20 years of activism thinking that urgency and fear would move people. It hasn’t. Except in a few rare cases, I see folks wake up when their lives are touched personally by climate changes or are inspired by the joy they see in others brought by this work. I also choose not to perpetuate narratives of victimhood and powerlessness. These are so often pandered by mainstream media, which reports on what’s broken, what’s “happening to us,” and what’s out of reach, instead of reporting on the myriad ways people can participate in good efforts, already underway, closer to home. Or on the ways people are asserting their strengths and exhibiting ingenuity and resilience. Our power lies not in getting global decision makers to do what we want, but in our ability to transmit to others, including to younger generations, in our presence: our love, sources of joy and sources of resilience. The frenzy of our activism neutralizes our work for peace. The point is not to win, but to build relationships. Mother Earth has been and is trying to save us all the time. Hidden in the salvation mentality, saving the Earth, is control through Western ego, religion, politics and their view of spirituality. To solve this precarious situation we have put ourselves as a human species, wherever we have placed ourselves is still not adequate. And I think that has to do with where my thinking process begins and originates, which is from the land. I thank therefore I am, rather than I think therefore I am. We have lost this kind of relational thinking. But we are also regaining relational thinking. Has to do with the birthright that we have survived whatever it was necessary for us to survive. We respect Mother Earth but we’re not paying homage to Mother Earth as if she is dying. We always say we’re going to save the Earth, we’re going to save the forest, we’re going to save a tree, we’re going to save ourselves, we have that idea of saving as if we’re the next messiah as a people. Mother Earth has been and is trying to save us all the time. We just haven’t yet learned how to let go because our ideas of ownership are still in place. And we’ve educated the wisdom out of a human being, out of ourselves.